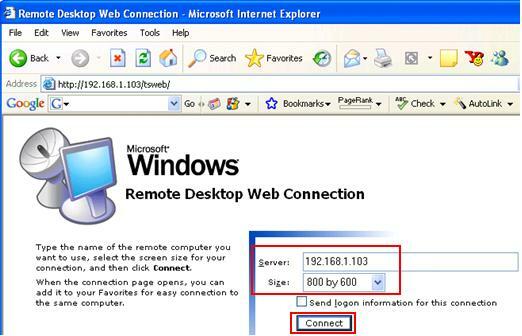 Establishing Remote Desktop web connection is pretty easy, as long as you have made the installation correctly on Remote Desktop Web Connection enabled server. Note: If there is firewall installed on web server, make sure you have configured to allow http traffic to pass through. 2) The Remote Desktop Web Connection page will be displayed. Key in the Remote Desktop enabled server IP or domain name and select screen size, after that click Connect button. In this case, the web server is also Remote Desktop enabled server. Note: If there is firewall installed on Remote Desktop enabled server, make sure you have configured to allow Remote Desktop traffic to pass through. Note: The web browser might prompt you to download and install the ActiveX control if you load this page the first time, just do it so that you can click that Connect button. 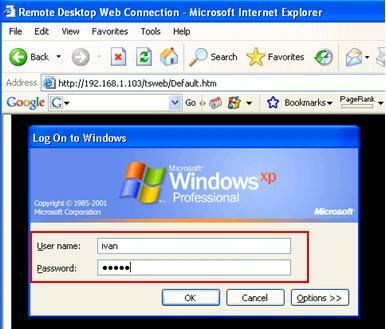 3) Once you get connected, key in the username and password and click OK button to log on to Remote Desktop’s windows. Easy right?? You are done..